Baseball, in my province, is infamous for being a very slow and boring sport to watch. I would usually follow a few matches on TV even though my aunt would always fall asleep in middle of the match. Indeed, baseball can be boring to watch, but it is in no way boring to play. This sport is probably one of the most exciting to take part in. While it seems slow when you're watching it, it goes really, really fast if you're actually on the field. Major S5 makes me feel exactly like that. Being on the field, even though I'm sitting on a couch watching an anime about baseball. I could very well go outside and play myself-- but why should I when I get the same thrill without any physical effort? Life as a professional baseball player isn't easy. There are many obstacles a pro (and any normal person at that) can encounter -- be it injuries, lack of motivation, slumps, family issues. Goro's life has never been a straight road, he might've lost the track many times, and yet, he's never failed to find it again. Sometimes, a series with lots of sequels will usually have its plot fall short after a few seasons due to lack of material and unecessary filler episodes. After the trainwreck season that was Major S4, I didn't know what to expect from the fifth one. It was probably going to be as boring and unevenful as S4. I personally believe that the fifth part of Major is the most meaningful as it brings a lot of character development along with a fine conclusion to an epic saga. Being a direct continuation from season four, Goro returns to Japan after his latest baseball season in the USA. Back home, he learns from his friend and rival, that there will be a baseball World Cup organized in America a year from now. S5 went back to its old 'match, heavy training, match, heavy training and fighting out with a rival' formula used in season 1 to 3. As much as it sounds like your typical shonen anime, what really made it special was that I could see the plot going somewhere-- it wasn't just random matches in a random tournament. It was the BASEBALL WORLD CUP for god's sake. The training was actually meaningful; winning the World Cup is a pretty big deal. What made the plot believable was that Team Japan itself didn't feel invincible (unlike other sports anime out there where the protagonist's team is made of mary sues with pratically no apparent flaws.) The only drawback is that a few matches could drag on longer-- they were hyped so much just to last an episode and a half. What a killjoy. There were also a few slice of life episodes that were actually revelant to the plot as they brought in a lot of room for character development, especially on Goro and Shimizu's side. I'll explain it later. Having switches studios (Hibari to SynergySP) since S4, SynergySP probably had troubles adjusting to the pace of the last three seasons, as it was not their creations. In S5, though, they've managed to fix many of the glaring flaws they've made in S4 : character development, pacing and art. Goro underwent a personality change, as he had to face his past once again with Joe Gibson and his new rival, Joe Gibson Junior, but still remained the same old cocky guy. I found very surprising that there was some romance development between Shimizu and Goro seeing how it was always hinted yet never fully confirmed. I chuckled many times because their relationship is so awkward, Goro being 18 with no real love experience, aside from baseball that is. Haha. Not only does the story follow the manga perfectly : the artwork stays true to its original work, though the art iself is pretty normal and has nothing to be praised about. Animation is excellent-- I could see that SynergySP actually tried animating, and the matches were much easier to follow in comparison to S4 where I had to rewind a few times to actually understand what happened exactly. That was one of S4's biggest and most annoying flaw : inconsistent animation. Atleast there weren't too many ugly faces. As for the music, I don't remember any BGMs from S5. That was probably because I was too concentrated in watching the match than listening to background music. In each episode, there is a small 2 - 3 minutes reminder of what happened in the last episode to refresh your memory. Right after that, the opening sequence 'Hey! Hey! Alright!' by SCHA DARA PARR feat plays. In my opinion, this song doesn't quite fit because it's a bit too out there for a simple baseball show. The first ending, 'Stay with me' by Hitomi Shimatani portrays pefectly the relationship between Goro and Shimizu starting from season five. The second ending, 'Jibun Color' by Yuu Nakamura gives you a breath of fresh air as you're standing on the mound as the umpire is yelling 'PLAY BALL!' The third and last ending, 'Kokoro E' by Road of Major, plays while a series of every important events from season 1 to 5 are shown in black and white as to illustrate a nostalgic past. That was a pretty clever thing to do. Major is a simple tale about a boy with only one thing in mind : playing baseball. Some people would probably find it unexciting because there are no over the top super powers like in Prince of Tennis or Eyeshield 21. Having no super powers is a good thing, in my opinion. 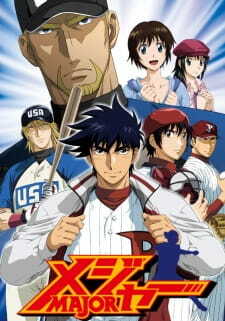 Since Major's baseball is the closest to being realistic (aside from Goro being a PITCHING MONSTER), I have come to find baseball more enjoyable as I learned many things about it in this anime. Not only that, but characters actually had to train very hard to even be able to compete with lower level teams : I like the harsh reality. In conclusion, Major S5 (and every seasons, actually) is for anyone who is interested in learning about what baseball trully is, without having to learning all these complicated rules and over the top mechanics. Remember-- what sets Major apart from other sports anime is how much more realistic it is. It’s the sum of all the first four episodes where dreams really came true. The story is about the final stage where baseball players live their dream as a professional. In this series, the final stage is a stage that is not common that takes place in an event of which you didn’t expect at most. Surely in this path there are obstacles that will stop you as it also helps you to grow stronger. The main attraction here would be about baseball and its spirit. As you watch this series most of the characters will be talking about baseball. Baseball with obstacles, perseverance, competitiveness, and spirit will go on through the series. The way it attracts is through its essence, and different playing styles and techniques. The flow and other attraction of the story is good, you will not be bored on it rather you may think that there’s missing on it. Obstacles, perseverance, competitiveness, and spirit give twist and tale to tell on the series. The art & animation is nicely done. The backgrounds of a baseball theme and the scenery of it, the people cheering and extras, other minor details, and even the OP and ED are all beautiful. The characters are drawn physically different from the other series that gives development of the story and characters which is greatly affects the uniqueness of it. The sound is a perfect match on the series. All the tense, cheering, and reactions are suitable to the art and animation, and its story. OP and ED song which gives hint of what the essence of the story is all about. It gives a very satisfying sound that will be heard throughout the series which increase excitement and thrill. One impression about the main character, Goro, is that his stubbornness always brings excitement and suspense to the show. He’s a guy who has no fear in front of a batter, always in a high spirit when in the mound, and a sportsman to its fellow player. Also Toshiya, Joe Gibson, and Joe Gibson Jr. also give a lot of help on giving excitement, thrill, twist, suspense through the story. These very helpful characters give worthy watching of the series. The enjoyment is about on how Goro surpass all the trials and achievement of his dreams. The game plans, tales and passion through that are what the series is all about. All are good because it’s composed of a nice story, art & animation, sounds and characters. A great sum up of the series which gives great thrill and excitement, sounds, story, art and animation.